Although widely consumed in Mediterranean cultures, artichokes are often avoided elsewhere in the world. Nevertheless, artichokes are simple to cook, fun to eat, and provide many important nutrients (several different minerals, vitamin C, and dietary fiber). An excellent way to prepare artichokes is to steam them, but in this article, I'll also discuss one of my favorite appetizers: grilled artichokes. An artichoke is the bud of a thistle plant with seemingly inedible thorny "leaves" (properly called bracts) protecting a mass of tough (and often sharp) florets. Artichokes (more properly known as Globe artichokes or French artichokes) have no relation to Jerusalem artichokes or Chinese artichokes (both of which are tubers consumed as root vegetables). Cutting open the artichoke reveals its anatomy - which has already been color coded for us. 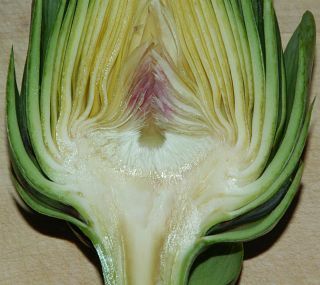 The green areas are tough and inedible (the bracts that form the outer layers of the artichoke). Yellow areas are mostly edible. These include the meaty base of each bract (where it connects to the base or receptacle at the top of the stem), inner soft bracts, the receptacle (referred to as the heart), and the interior of the stem. Purple and white (the area directly under the purple) means "Don't Eat Me" - these are what would have become the purple thistle if the artichoke was allowed to fully mature. 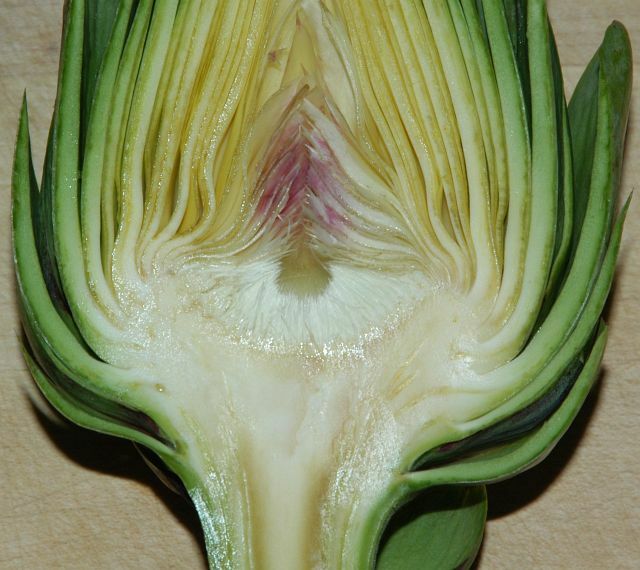 Let's take a closer look at the center of the artichoke. The fleshy recepticle at the top of the stem where all the bracts and the florets (the choke) attach to is called the heart. 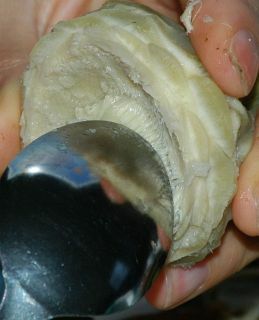 The choke is inedible, so needs to be removed either before cooking or while eating. I start preparing grilled artichokes the same way as I prepare them for steaming. I typically start by getting an inch of water boiling in a pot with a steamer insert as I prepare the artichokes. 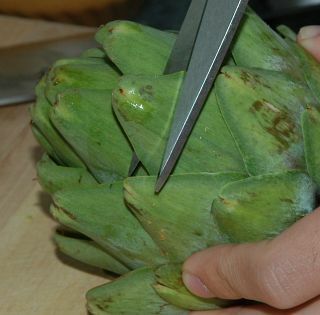 Prep the artichokes by using a pair of kitchen shears to cut off the thorny tips of each of the bracts. Cut about 1/4 of the bract off during this operation. This is done as a courtesy to the diner's fingers (and it makes the artichoke look nice). Once the bracts have been trimmed, use a large, sharp knife to cut off the tip of the artichoke. Cut off either the whole stem or just the tip (where it's brownish black). 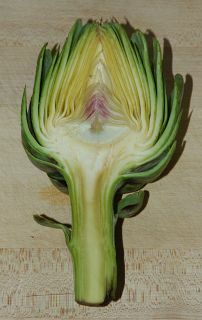 The stem is edible, but unless the artichoke is very large, the flesh is quite bitter. If you plan on eating the stem, just cut a little bit off the stem. If not, then you can chop the whole stem off. 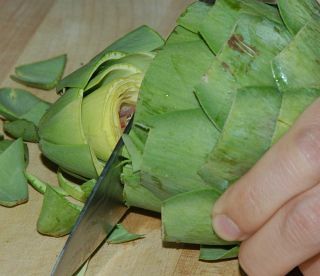 If you're trimming multiple artichokes, you should place the trimmed artichoke immediately into some acidulated water (water in a large bowl with the juice of one or two lemons squeezed into it) to keep the exposed flesh from turning black or brown. I don't usually bother with the acidulated water - I prefer to simply place the artichoke into the pot to steam. As I finish trimming each artichoke, I add it to the pot. When I place the artichoke into the pot, I place it stem side up - they stand better that way. 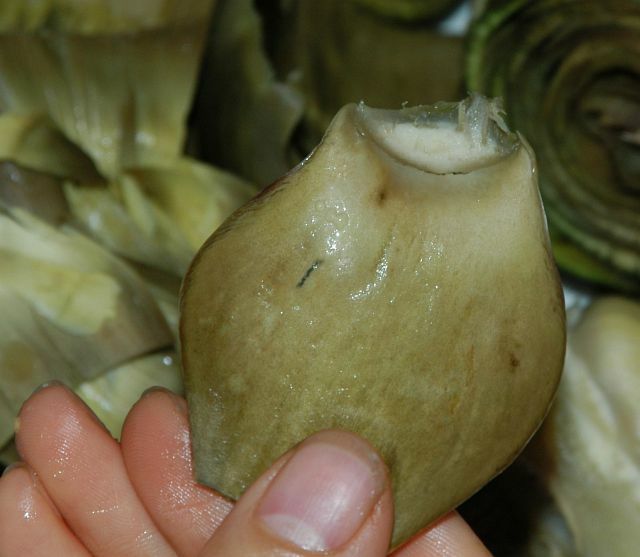 Artichokes can be steamed until they are completely cooked (anywhere from 20 to 45 minutes depending on size). 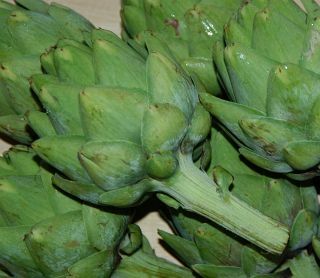 Sticking a fork into the stem (through the cut side) and meeting no resistance at all usually indicates the artichoke is done cooking. Remove the artichoke and allow to rest for 20 minutes before serving. However, for grilled artichokes, just steam the artichokes for 15 minutes and remove. (While steaming the artichokes, preheat the grill.) The artichoke will be softened but not fully cooked. Cut the artichoke in half along its axis of symmetry. The artichoke will still have its choke. Using a melon baller, measuring spoon, or tableware spoon, scoop out the choke and discard. Be careful, the choke can make quite a mess if allowed to - just scoop and toss. If you miss a bit of the florets, use the spoon to scrape against the heart and the florets should come off onto the spoon. Cut open and remove the chokes from each artichoke and then brush the cut side of the artichokes with olive oil, being sure to coat the heart. Generously sprinkle salt and pepper over the cut side and transfer to a hot grill. Grill over medium heat with the cut side up for 10 minutes and then flip the artichokes over and grill for another 5 minutes. Serve with Dijon mustard mayonnaise or sauce of your choice. Starting form the outside and working your way in, snap off each bract from the base of the artichoke. The bract will have a fleshy, yellow part (where it was attached to the artichoke) - this is the part you eat. 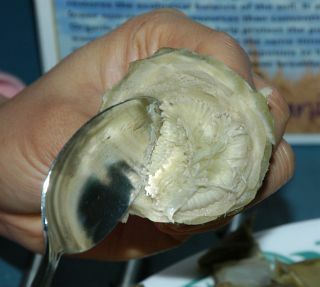 Dip it in a sauce (or not) and scrape the yellow portion off the fibrous bract with your teeth. 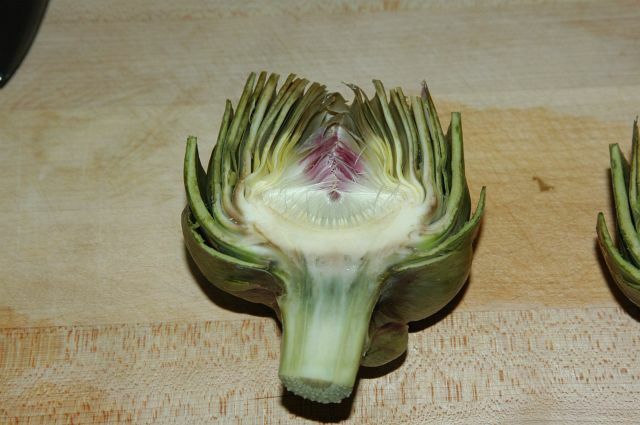 Place the spent bract in a discard pile and draw another bract from the artichoke. Once all the green bracts have been consumed, you will be left with a bunch of light yellow parts that have not yet become fibrous bracts. These are mostly edible, but may or may not be worth your time. Proceed eating them as you desire - or simply remove them as you would pluck petals from a flower. Eventually you will reach the purple color that signifies "Stop Eating". Just grab the purple "petals" and as much of the remaining "petals" underneath and twist and pull them off. This will leave only the florets of the choke. 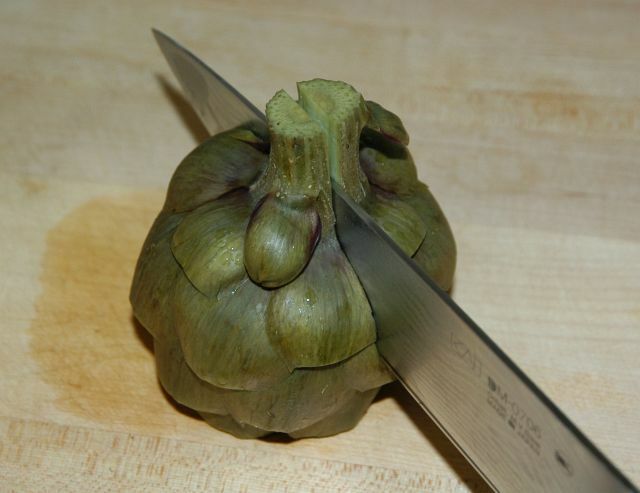 Use a spoon to scrape the florets off the base or heart of the artichoke. 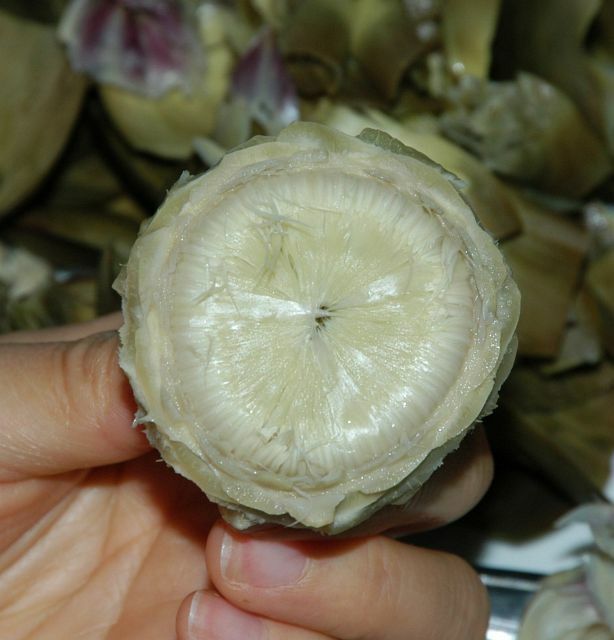 With the heart cleaned, the rest of the artichoke can be consumed in its entirety. The stem can be bitter (especially the flesh near the exterior), so some diners may wish to avoid it. As a special note, smaller artichokes can be consumed whole, choke and all, if the other bracts are removed. When pickled, the smallest of artichokes are sold as pickled artichoke hearts (they include not just the hearts but the soft tender bracts as well). Grilled artichokes sound really great but are you supposed to eat them as you would a steamed artichoke (by pulling the leaves off) or can you eat the whole thing? 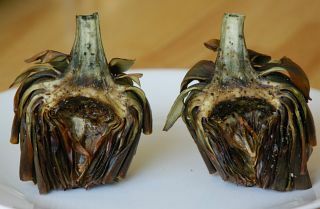 If you grill medium or larger artichokes, you should peel the bracts off individually and eat just as if they were steamed. The taste will be a bit different and the bracts will be dry and a little crispy to hold. 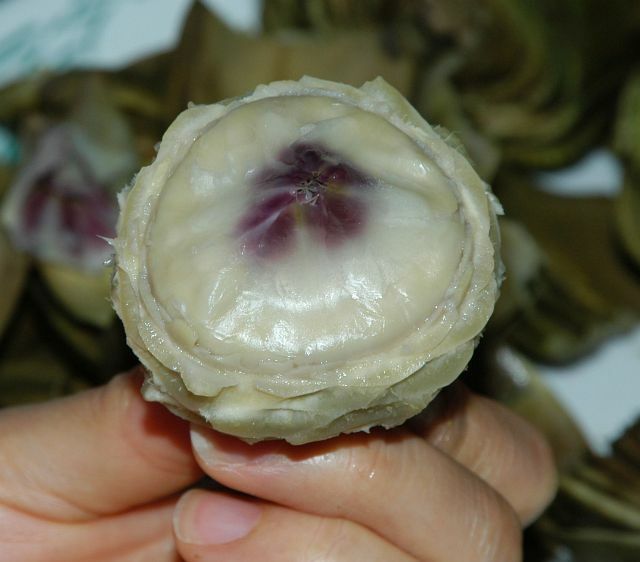 If you use baby artichokes, you can eat the whole thing - but you should remove the outer layer of bracts first (as if you were planning to make fried artichoke hearts which would be another article). So, remove the outer bracts first leaving only the tender ones and steam, cut, clean, grill, eat. This is fantastic. This is the first time I've come accross your site and I think it is great. Thank you for taking the time to create it. Kudos to you! 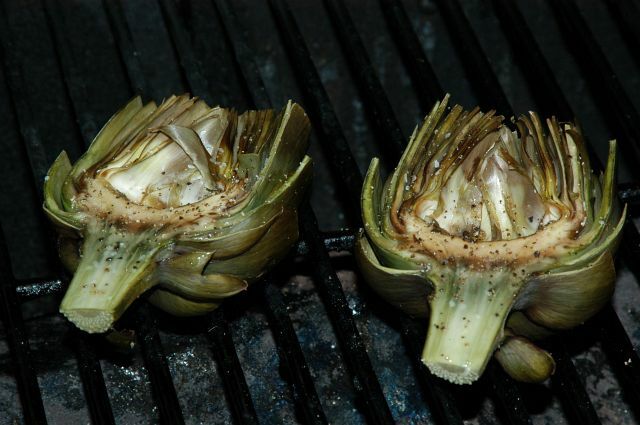 For those of us without an outdoor barbeque, is there any way to grill artichokes with a George Foreman grill or oven? Subject: Re: Indoor grilling alternatives? Sure, try placing the artichokes about an inch under the broiler in your oven and broiling for a comparable amount of time (as if you were grilling). Keep an eye on it (just as you would on the grill) to make sure it doesn't burn. On the indoor grill, you can try keeping the grill open and grilling them like that. Times will vary depending on the power of your electric grill. I enjoy your site, I'm looking forward to trying this recipe (bought some Artichokes last night)! Thank you for creating such a great website!! 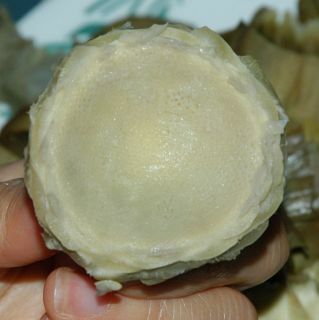 I have always steamed my artichokes, it is great to have a new way to cook them!! The instructions are easy to follow, and the pictures are really great!! Great article -- inspired me to actually try cooking artichoke for the first time. I did try the George Foreman method (don't have a grill, can't use one at my apartment easily) -- I would suggest maybe extending the cooking time beyond the 10 min (flip) 5 min for the electric option. My 'choke was cooked well enough, but didn't get the blackened, grilled flavor or look. Will have to try the broiler next time. Also did a variation on the sauce -- yogurt with dijon mustard, a little worcestershire, and some "cajun" spices. Was quite good...and just so this doesn't start a "healthy" war ;) -- I hate mayo. Just discovered a new boyfriend whom also loves artichokes, can't wait to try them out just as I tried him out. Probably just as yummy! I discovered your site this morning after reading an article on artichokes in an Italian magazine for Americans living in-country (I went to Google...). I am an accomplished cook and have rarely seen such complete directions for artichokes in particular. Cudos to you! Where do I find seeds on the artichoke? I would like to harvest some so that I can pass them on to friends. Just discovered your site, and as a teacher, I cannot tell you how much I appreciate the "presentation" of your lesson. A picture truly is worth more than a thousand words! Can't wait to try to recipe. Thank you! Outstanding, clear easy to understand steps re grilled artichokes... am steaming my home grown ones as we speak, ready to be grilled. Am very much looking forward to perusing the rest of your site. Congratulations and thanks again. I just want you to know that this step by step on grilling artichokes is excellent...the pictures help as well! Thanks! This site is great- as soon as I saw the headline (analytical cooking) I felt like I was home! This artichoke recipe looks like something I can do, unique in comparison to the other artichoke links I found. I bought an artichoke today and I'd be cooking it right now if I had some veggie mayo. Any other dips that are easy and vegetarian? Thank you for an outstanding primer on preparing and eating an artichoke. I ordered a steamed artichoke at a restaurant last night and now I know that the parts that I ate are OK. I did chew the fibrous leaves but didn't swallow the leftover fibers. What a great article--thanks! I saw fresh baby artichokes at Publix yesterday and plan to grill them. Not something you come across every day in Nashville. WOW... awesome instructions, that were so easy to follow. I plan on grilling some artichokes right now. Love your site so much I had to add you to my favorites list!! Bought a grill and then bought artichokes hoping to fing a site about how to grill them. I gambled on finding instructions and googled your site. Thank you for such clear instructions! You didn't make it more difficult than it had to be and it was great! I added Italian seasonings and fresh garlic and they rocked! Thanks again! :) I tried the grilled artichoke and was impressed. Being Italian i have eaten them since I was a kid. I have always had them stuffed. these were excellent. The second time I made them i spiced up the sauceby adding a hint of garlic and Oregano. Also for the oil I added onion, black olives salt, pepper, basil, oregano, parsley and a little romano cheese. 1/2 tsp salt, 1/4 tsp black pepper, mixed in 2 tbs lemon juice. A tsp drop of light mayo in the dip, on the side. Dip the artichoke leaf in the mixture with a light drag on the mayo to eat. This dip works also very well with steamed crab! I thoroughly enjoyed your description of how to steam and grill the artichokes. May I thank you for your unique and detailed recipies. Step by step is the best, and you do not assume the reader" knows all about the subject"
Thank you Michael for posting this blow-by-blow account of artichoke preparation. I cooked them many years ago, completely forgot how to do it, and was saved by your first-class page. All the diners enjoyed it. Good for you! I've got a late-season grilling event this Saturday, and I'm trying to figure out a practical (and not too expensive) way of steaming up some artichokes on the scene of the grill. The grill does have an available but I won't have an opportunity to steam them before I arrive at the grill. I'm going to try it anyway-- fab something together with a foil pan, my steamer basket, and I think I have a spare foil cake-pan which, filled with water, should survive the burner just fine. Excellent suggestions. I ususally snap off the outer bracts all around the artichoke until getting to the softer yellow leaves, then cut off the top third and quarter the artichoke. I like having more charred service and the quartered artichoke seems easier for people to just pick up and eat. I use a small paring knife to cut a v groove over and under the choke and remove it. As you wrote, olive oil, salt and pepper are all that are needed for htese babies. I highly enjoyed the grilled artichokes, they were wonderful. I do not like mayo based sauces for them though. What I use, and this is very unhealthy but delicious, is 1-2 TBSP butter, 1 garlic clove minced, seasoned salt and fresh cracked pepper, heated. Very simple and very good. Wonderful info on grilled artichoke. Now, I'm no engineer, but top this off with a lemon Aioli, and you're in heaven. Aioli - shortcut is mayo (best foods) pinch of cayenne, fresh lemon juice, minced garlic, minced or shredded green onion, salt & pepper..... yum P.S. if you're a true engineer, perfectionist, you'll want to make your own mayo 1 c. Extra virgin olive oil, 2 large egg yolks, salt & pepper. Wow! I've never done this before but it turned out GREAT!! 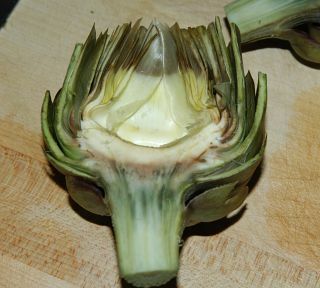 Your procedure for preparing the artichoke had adequate detail for a novice like me to successfully complete it. Thanks! Wow ! It�s a nice recipe. Last time I checked, our grill was home to a nest of wasps (for the second time) so no grilling right now till they're dealt with. Irritating. We have artichokes quite often though and just use a quick-lazy method that works for us. Even the prep is done lazy-way. Just turn on the grill... should take care of the problem. I love your approach to sharing recipes. I'm not an engineer, but a lawyer, and I really appreciate the step by step and context. Appeals to and affirms the ridiculous methodical way i have! Brava/o! Thank you for the great information and photos! That's the best tutorial I've ever seen.